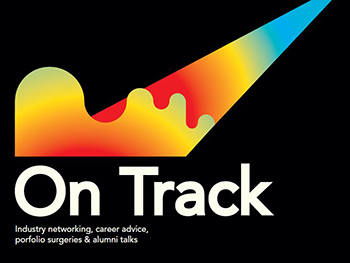 Second and third year BA (Hons) Graphic Communication students and alumni were recently invited to attend ‘On Track’, an all-day event with alumni and design companies offering career advice, talks and professional portfolio surgeries. It was the first time an event like this had been run for Graphic Communication students and acted as a great opportunity for them to think about their work and their future careers. The day began with a range of talks from alumni, on subjects ranging from pursuing a Master’s degree to how to prepare yourself for industry. 2016 alumna Anna Smith spoke to students about her role as a Digital Designer for River Island, where she contributes to social media posts and uses her design skills to create material such as press invites and blogs. Whilst studying at Birmingham City University, Anna got through to the semi-finales of Adidas Academy 2017 and has since gained experience in a diverse mix of projects, from branding for John Lewis, Wireless festival and various start-up companies, to animation sequences for Film4’s showing of ‘The Wasp Factory’. As well as showing examples of her work, Anna offered some excellent advice on how build up a great portfolio. She emphasised the importance of including work that is of a personal interest and how going the extra mile with briefs can help you stand out to potential employers. This message was echoed by 2016 alumni Matt Holford and Adam Lloyd who were integral in helping to organise the event and spoke to students about how they can prepare themselves for the world of work. Matt and Adam’s top tips for working for an agency included: ensuring you have a sound knowledge of design software such as Adobe Photoshop, InDesign and Illustrator, having good time management skills and being easy to work with. Other alumni speakers included Tom Smith, who spoke to students interested in fashion and branding design and Liam Roberts, a digital designer for Kinnersley Kent Design, a company that specialises in branding, graphics, interiors and more, and whose clients range from Jamie Oliver to Mercedes. I really enjoyed the session and it was interesting to hear about his agency’s projects. I feel like hearing from a recent graduate of the course was really good as he had a lot of advice for us about the course, for interviews and working life. 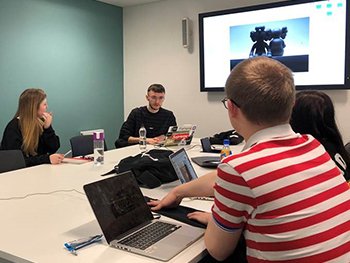 The event was a resounding success and organisers hope to build on the day by opening it up to other courses within the School of Visual Communication in the future.